After judging was completed earlier in the year, I was rather excited to be invited to attend the official reveal of the Winners of the Free From Food Awards 2016 but as fellow Coeliacs will know, sometimes your health can take a turn, usually when you least expect it and when you don’t want it! Indeed, I was so ill (from something I had eaten and glutened) that travelling to the Royal College of Physicians was definitely a No-No and facing a wonderful buffet spread of Winning Food was missed. Such a shame as I was looking forward to trying, tasting and enjoying (again) some of the best GLUTEN FREE and DAIRY FREE (and some EGG FREE) foods I have ever had and of course catching up with Antony Worrall Thompson. The Free From Food Awards 2016 are the UK’s only industry awards for FreeFrom foods which started in 2008 by FoodsMatter and FreeFrom Foods Matter to encourage innovation and celebrate excellence in the FreeFrom food industry. The awards are entirely independent, supported by sponsorship and entry fees only. As a blogger, with a focus upon Chocolate (Chocolate Bars, Chocolate Bags and Chocolate Boxes), as well as enjoying travelling and eating out, it was great to support this year’s competition after (attending the Free From Eating Out Award ceremony last year). So the Winners from the Free From Food Awards 2016, BIG DRUM ROLL….. The Overall winner and recipient of the FAIR Trophy for the Best FreeFrom Food 2016 went to GLUTEN FREE Nutribix. Now this I have seen on offer in several retailers at the moment is a breakfast cereal without cereal as it’s a weetabix look-a-likey. One of the judges stated “So very clever – a real Weetabix lookalike! Not easy to make – but crunchy and very satisfying. Excellent ingredients – 96% wholegrain sorghum!!! High protein too. Love the way it has been blended. What a fab idea – it definitely should be the winner! !” but I have to confess I do not eat cereals so I won’t be trying it or buying it but I know from my own judging session, that this made a huge impact with my fellow judges. Booja-Booja Hazelnut Chocolate Truffles: Now these I tasted and tried when judging “Chocolates & Confectionery” and loved them. These are a rich delicious chocolate which are also DAIRY FREE and SOYA FREE (which I have found is quite a challenge). Gozo Deli Basil Pesto Casheese: A DAIRY FREE Cheese which is meant to taste like Cheese (which is so hard to find!). Tesco Free From Garlic Baguette: Which I have found in my larger Tesco EXTRA and good because as well as GLUTEN FREE, it’s MILK FREE and EGG FREE and tastes like Garlic Bread with a great crunchy crust. Let’s hope this product remains on the shelves as the Free From Onion Rings have been pulled by Tesco which is such a shame. I recognise that all producers and manufacturers have to make profits but such a shame when they change their ranges. I also missed out on catching up with Michelle Berriedale-Johnson who I greatly admire for her passion, knowledge and experience in the FreeFrom Food world. Cocoa Libre 3 Mini Slab Bars; And these taste great! D&D Chocolates Dairy-Free Chocolate Drops that are DAIRY FREE, GLUTEN FREE, NUT FREE as well as SOYA FREE. Eskal Gluten Free Wafer Rolls: Whilst you don’t get many in a packet, these are lovely with a crisp wafer and chocolate all the way throughout. Indeed, they should make these in larger boxes! Eat Allergy Safe Handcrafted Vegan Gluten Free Dark Chocolate Truffles: A very strong Coconut flavour (which I’m not so keen on) but you wouldn’t know they were “special” Chocolates. Solkiki Balinese Coconut / White Chocolate which looked beautiful and tasted really rich for a white chocolate. So make sure you check out this award-winning Chocolates & Confectionery if you have a sweet tooth. Of course other GLUTEN FREE Chocolate Bags and GLUTEN FREE Chocolate Boxes and of course, GLUTEN FREE Chocolate Bars are available, (Posts have photographs, Manufacturer links and allergen information). And LOOK OUT for my contributions to the FreeFrom Eating Out Awards which opens this month! (I won’t be sharing any confidential details until the official announcements and big reveals but looking forwards to Eating Out: GLUTEN FREE, DAIRY FREE and EGG FREE! Photographs courtesy of FreeFrom Food Awards and my personal collection. This information was correct as of June 2016. 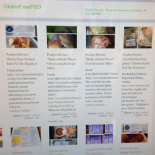 This entry was posted on June 17, 2016 by glutenfreepsd in News & Views, Product Review: and tagged booja booja, Chocolate bars, Cocoa Libre, DD Chocolate, Eskal, FreeFrom Eating Out Awards, FreeFrom Food awards, Gluten Free Chocolate, Gluten Free Chocolate Bars, Michelle Berriedale-Johnson, Nutribix, Solkiki.